that I was riding on my VFR 800 back from a memorial ride for another club rider who had recently lost his life. It had been a longish day with an early morning meet in Middlesbrough that meant an even earlier set off for me from Cockermouth in Cumbria. We rode through the North Yorkshire Moors to Scarborough and then on to Whitby, stopping to pay tribute to our dear pal. There was a delay in Whitby to let everybody catch up, but eventually we got going again. Fatefully I had loaned my paramedic reflective jacket to Dave, who was riding at the tail of the group. Like usual, the group spread out as everyone found their own pace. By and large a band of experienced and careful motorcyclists (I was an advanced rider myself), we allowed the group to stretch out and settle into its own rhythm. I was a little tired, but still enjoying the ride. Increasingly, and only on reflection, I was aware of a darkness descending. It was akin to entering a strange dream. You could call it a premonition, but I’m not sure it was as clear as that. However, the A171 stretched out and expanded into a series of bends and undulating hills. It was whilst descending one of these that a car emerged from the Dalby Forest junction. I have a recollection of something occurring that made me take some sort of evasive action, but that’s it. The next thing I knew I was lying on the tarmac, quite calm, but knowing something was wrong, very wrong. My mate Dave was with me so I had obviously been unconscious for some time cos I knew he was riding at the rear. I couldn’t move my arm, but I was quite cogent. 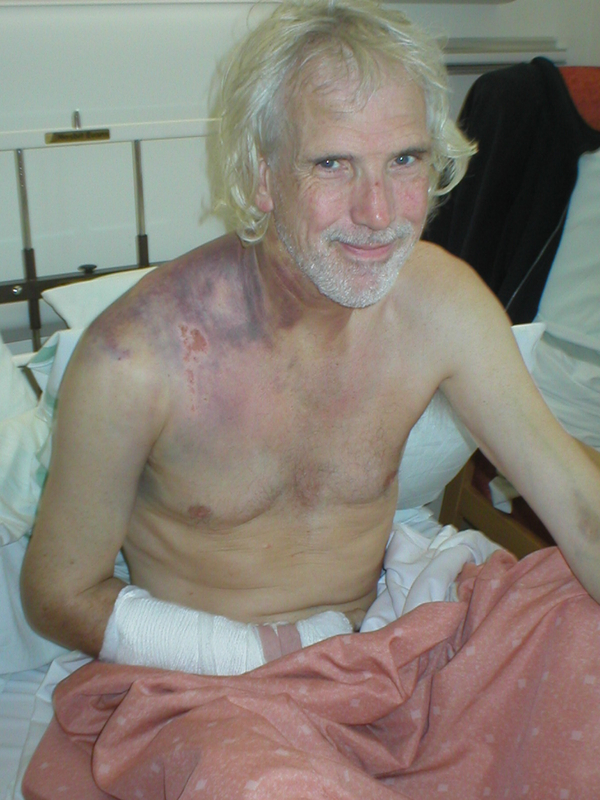 Dave, like me had had specialist training in motorcycle accident recovery so I knew he would be looking after me. Perhaps I kept passing out for the world kept disappearing and reappearing, but before too long the ambulance crew arrived. I wasn’t aware of much conventional pain, but going into the van, there was a sudden wave of very, very severe pain, that I now recognise as neuropathic pain from the traumatic brachial plexus injury sustained. Off they whisked me to the James Cook hospital, a journey I have no recollection of. Whatever they gave me at the James Cook hospital worked because I can’t remember much from being treated in the trauma centre. Evidently they were concerned about a brain injury when they heard me talking jibberish, but what’s new. There followed surgery to plate my right artist and repair a shattered shoulder using a hook. The brachial plexus injury attracted lots of medics eager to have a look at me. Lizzi came and stayed with me in hospital, but it was three weeks later that she was able to drive me back to Cumbria, via Carlisle Infirmary. Two huge challenges faced me. The first was how to adjust to the practicalities of life using my left arm/hand only. Being right handed all my life up to this fateful point, this was going to be something of a struggle! The second was how to cope with the acute, chronic and constant pain associated with the brachial plexus injury. I’m going to write more on how I managed in future blogs. For now I’m just grateful for having survived and rebuilt a fabulous life with the help, love and constant support of Lizzi, my children, the rest of my family and faithful friends. Oh – and the 70 year chap who knocked me off was successfully prosecuted for driving without due care and attention. Yep! you just can’t put into words. 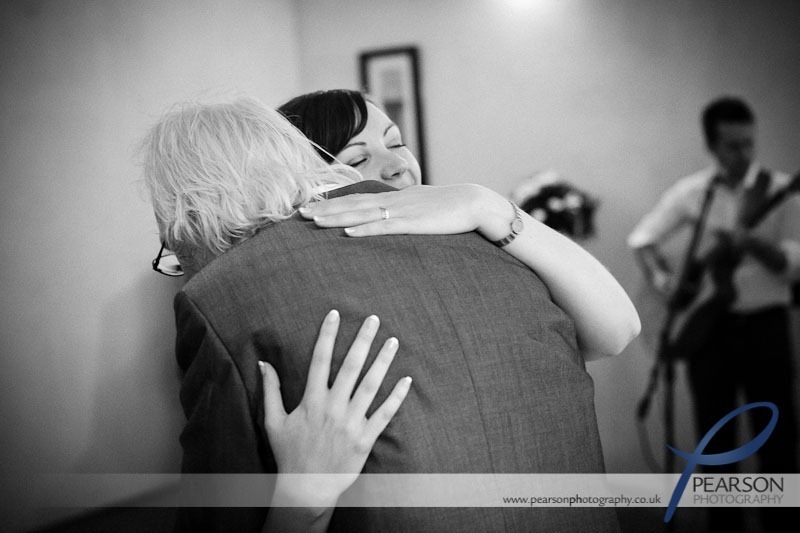 Our beautiful daughter, Sammy, with me on her wedding day…………..